#145. Lake Marian - Humboldt Range - Nevada. 6 x 8.5, chromolithograph. Title on plate. This picture is Plate II in Clarence King's Systematic Geology, published in 1878. It is based on an oil sketch by Gilbert Munger. He was guest artist with King's 40th Parallel Geological Survey in 1869 and 1870. 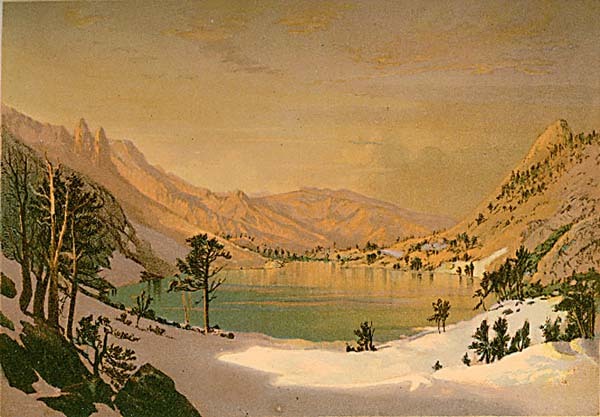 A Munger sketch of Lake Marian is mentioned in an 1870 diary entry of S. F. Emmons. Clarence King discovered the lake in 1868 and named it after his sister Marian. The lake is now called Overland Lake and is located in the Ruby Mountains 50 miles SE of Elko. The plate closely matches paintings #1, #2, #178, #181, and #304. 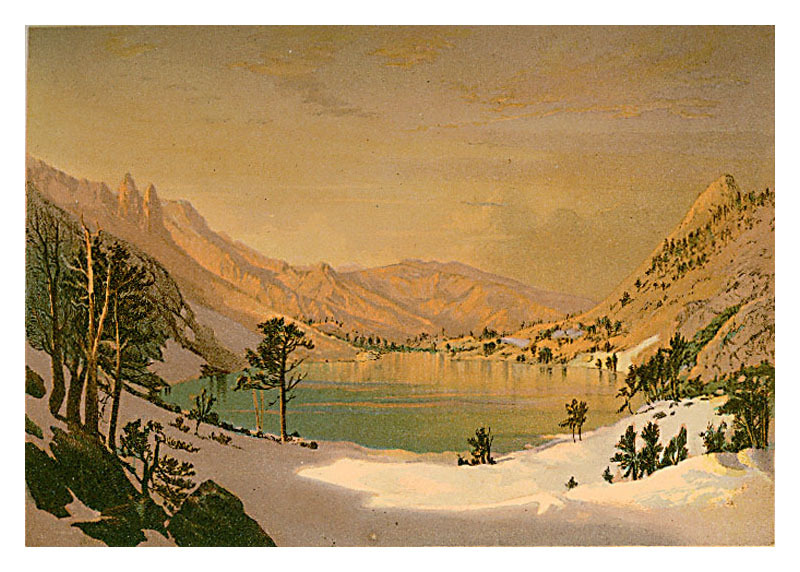 A smaller version of this image appears as a chromolithograph titled "Marian - See im Humboldtgebirge (Nordamerika)" in Allgemeine Geologie by Melchior Neumayr (1845 - 1890), published as volumes 1 and 2 of Erdgeschichte in Leipzig, Germany, in 1886. QFD 14. Image is a direct scan of the Systematic Geology plate.